When President Warren Harding and Vice-President Calvin Coolidge took office in 1921, the economic health of America was in critical condition. Still trying to recover from The Great War, the unemployment rate was a staggering 11.7%. During Progressive Democrat President Woodrow Wilson’s term, the national debt skyrocketed from $1.5 billion to $24 billion, partly due to the expenses of World War I, while the Gross National Product plummeted from $91.5 billion to $69.6 billion in just one year. These conditions were profoundly worse than the years leading to the Great Depression and overwhelmingly more disastrous than the economic climate Obama inherited in 2009, despite the political mantra against the Bush presidency. Upon taking office, Harding and Coolidge did not spend their time or effort blaming Wilson for the country’s woes. Instead, they rolled up their sleeves and got to work. They stood on principles, not propaganda, and implemented a very simple, very liberating agenda: cut federal spending dramatically and reduce the burden on both individuals and businesses by lowering taxes and reducing regulations. Unfortunately, Harding’s administration was riddled with corruption and scandal, which began to greatly hinder his objectives. That changed after his sudden death in 1923 as Coolidge quickly brought integrity and morality back into the Executive Branch. The only president to be born on the 4th of July, it was fitting Coolidge held so strong to the Founding Father's vision for our country knowing “American ideals do not require to be changed so much as they require to be understood and applied.” He believed that "Three very definite propositions were set out in its (Declaration) preamble regarding the nature of mankind and therefore of government. These were the doctrine that all men are created equal, that they are endowed with certain inalienable rights, and that therefore the source of the just powers of government must be derived from the consent of the governed." The Progressive mindset believes it is the government's job to "spread the wealth around" but Coolidge understood and warned of the dangers and oppressive nature of this perspective. “The individual, instead of working out his own salvation and securing his own freedom by establishing his own economic and moral independence by his own industry and his own self-mastery, tends to throw himself on some vague influence which he denominates society and to hold that in some way responsible for the sufficiency of his support…. This is not local self-government. It is not American. It is not the method which has made this country what it is. We can not maintain the western standard of civilization on that theory. If it is supported at all, it will have to be supported on the principle of individual responsibility.” Coolidge's policies prove that the most effective way to raise people out of poverty is to give them the liberty, freedom and responsibility to live their own lives. The Progressive view of abortion promotes we are not all equal. A mother’s right to be free of the burden of a child is greater than the baby’s right to live. Furthermore, the theory people can be made equal through governmental redistribution is not progress but a return to the parochial and supremacy ideology of generations before us who used political status and power to enslave the population. Life as we know it began because of the Coolidge presidency. Under his guidance, America experienced a nationwide economic boom known as the "Roaring 20's". Lower taxes allowed business owners and entrepreneurs to use their money to hire more workers, increase production and services, expand their business and grow the economy as "after all, the chief business of the American people is business". The public sector shrunk while the private sector exploded. Wages naturally increased, rising 37%, resulting in the emergence of the middle-class. Coolidge’s small government strategy allowed millions of families to rise out of poverty and enjoy a profitable living for the first time. Americans purchased their first cars, electricity became a staple in urban homes, and families reveled in a never before seen disposable income to buy luxuries such as radios, phones and refrigerators. Often characterized as a Scrooge by his critics, Coolidge’s conservative approach actually oversaw one of the most productive and abundant times in American history. Republicans chose Herbert Hoover, who had served under Harding and Coolidge as Secretary of Commerce, to replace Coolidge. Despite having never held an elected office, Hoover easily won his party nomination and the national election. Eight months into his administration, the Wall Street Crash of 1929 sent the nation into a panic. Instead of holding firm to his predecessor's conservative economic policies of keeping expenses and taxes low, especially at lean times, Hoover began growing the government. He expanded public works programs by over a billion dollars, including funds to the building of the Hoover Dam. To pay for such spending growth and keep a balanced budge, Hoover increased corporate and income taxes, raising the top bracket from 25% to 63%. As a result, unemployment naturally rose. Adding insult to injury, Congressional Republicans passed the Smoot-Hawley Tariff Act, which raised tariffs on imports. Despite sever opposition from economists, business executives and Hoover himself, he signed the bill into law. In retaliation, other countries imposed their own tariffs on American goods, which severely hindered America’s economy further. What should have been a natural and temporary economic adjustment turned into the basis for a sweeping victory for Progressive Democrat Franklin D. Roosevelt and his promise of a New Deal. Where Coolidge cut taxes and spending, giving the money back to the people, FDR pushed through a series of domestic programs expanding government, spending, and taxing which he said gave a “more equitable opportunity to share in the distribution of national wealth”. FDR’s actions prolonged the Depression for many years longer than it should have. Obama followed the same path with his 2009 Stimulus bill with much of the same results, a bloated government, skyrocketing debt, and plummeting economic conditions. Other countries experienced the same economic hiccup America had in 1929, but the United States is the only country where it lasted so long and was so deep that it is known as the “Great” Depression. To pull America out of the Progressive spin it is in today, we don’t need a Hoover (Trump, Bush) or Roosevelt (Clinton, Sanders). America needs someone with the same principles, spirit, focus, and desire of our Founding Fathers. As Coolidge summarized, “The American Revolution represented the informed and mature convictions of a great mass of independent, liberty-loving, God-fearing people who knew their rights, and possessed the courage to dare to maintain them.” We need a president who supports entrepreneurship and believes successful business owners improve our economy. Not one who demeans businesses and depicts profits as evil. We need someone who understands and respects the rights and liberties granted to the people through the Constitution and is willing to fight for them. We need a Calvin Coolidge. Several excellent candidates are running that fit this description perfectly. The question is will America wake up in time and choose one as our next president. 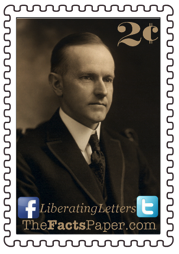 Coolidge described our country’s greatness and the path to its preservation in the conclusion of his Declaration speech. "We live in an age of science and of abounding accumulation of material things. These did not create our Declaration. Our Declaration created them. The things of the spirit come first. Unless we cling to that, all our material prosperity, overwhelming though it may appear, will turn to a barren sceptre in our grasp. If we are to maintain the great heritage which has been bequeathed to us, we must be like-minded as the fathers who created it. We must not sink into a pagan materialism. We must cultivate the reverence which they had for the things that are holy. We must follow the spiritual and moral leadership which they showed. We must keep replenished, that they may glow with a more compelling flame, the altar fires before which they worshiped."